A normally reliable Soyuz FG rocket malfunctioned two minutes after liftoff from Kazakhstan Thursday. The malfunction forced a Russian cosmonaut and his NASA crewmate to execute an emergency abort and a steep-but-safe return to Earth a few hundred miles from the launch site. Russian recovery crews reported the crew came through the ordeal in good shape. "NASA astronaut Nick Hague and Russian cosmonaut Alexey Ovchinin are in good condition following today's aborted launch," NASA Administrator Jim Bridenstine tweeted from Kazakhstan. "I'm grateful that everyone is safe. A thorough investigation into the cause of the incident will be conducted." Ovchinin and Hague blasted off from the Baikonur Cosmodrome at 4:40 a.m. EDT (GMT-4; 2:40 p.m. local time), kicking off what was expected to be a four-orbit six-hour flight to the International Space Station. But two minutes and two seconds after liftoff, just a few seconds after the rocket's four liquid-fueled strap-on boosters separated from the central core stage, something went wrong. "Failure of the booster," a translator called out, presumably relaying a report from Ovchinin to Russian mission control near Moscow. "Failure of the booster." Moments later, he confirmed the Soyuz had separated from the rocket's upper stage, saying "we are in weightlessness." Moments after that, as the spacecraft plunged back into the thick lower atmosphere, it rapidly decelerated, subjected the crew to nearly seven times the normal force of gravity at one point. "We are getting ready for the G loads," Ovchinin reported. "G load is 6.7." "Copy," a Russian flight controller replied. "We are feeling rotation, the G load is going down," the cosmonaut reported. "G load is 2.72 and going down." "Tighten the straps" for landing, the flight controller called. Air-to-ground communications with the crew were cut off shortly after that exchange, either because NASA or the Russian space agency opted to keep the loop private, because of a malfunction or because the capsule passed beyond the range of its radio system. In any case, NASA launch commentator Brandi Dean, monitoring events from the Johnson Space Center in Houston, reported the Soyuz's descent module landed near the town of Dzhezkazgan, a familiar staging site for normal Soyuz re-entries and landings, about 250 miles from the Baikonur Cosmodrome. Russian recovery crews dispatched from Baikonur aboard helicopters reached Ovchinin and Hague by radio before arriving at the landing site and reported both crew members were in good shape. Photographs later were posted by the Russian space agency Roscosmos, showing both men relaxing in Dzhezkazgan, chatting with support personnel. It was not immediately known what might have gone wrong with the Soyuz FG booster, but Dmitri Rogozin, director general of Roscosmos, said a State Commission would investigate the mishap, adding in a tweet "the Soyuz MS emergency rescue system worked. The crew is saved." It is not yet clear what impact the abort might have on upcoming Russian flights to the space station. A Progress supply ship is scheduled for launch at the end of the month and the station's current crew -- Expedition 57 commander Alexander Gerst, Serena Auñón-Chancellor and Soyuz MS-09 commander Sergey Prokopyev -- is scheduled to return to Earth on Dec. 13. Soyuz MS-11 commander Oleg Kononenko, Canadian astronaut David Saint-Jacques and NASA astronaut Anne McClain are scheduled for launch from Baikonur on Dec. 20, but it's not yet known whether the failure investigation will be complete by then or even which crew -- Ovchinin's or Kononenko's -- will be on board. In the near term, two spacewalks planned by Hague and Gerst on Oct. 19 and 25 to replace a set of batteries in the station's solar power system will be deferred. Two upcoming U.S. supply ships presumably will launch on schedule in November. Thursday's launch was the first mishap for a Russian Soyuz booster since an earlier version of the rocket caught fire on the pad before launch in August 1983, triggering a dramatic abort that subjected Vladimir Titov and Gennady Strekalov to 17 times the force of gravity as the capsule was pulled away fro the exploding rocket. They landed about two and a half miles from the launch pad, shaken but in good health. The only other Russian manned launch failure occurred in 1975 when the booster's second and third stages failed to separate. Vasily Lazarev and Oleg Makarov reached an altitude of 119 miles before descending to a landing about 978 miles from the launch site in the Altai Mountains. The crew was rescued without incident. The only fatalities in the Russian manned space program occurred during re-entries from orbit. Cosmonaut Vladimir Komarov was killed in 1967 when the parachutes in his malfunctioning capsule failed to inflate. Three cosmonauts -- Vladislav Volkov, Georgi Dobrovoiski and Viktor Patsayev -- lost their lives in 1971 when their Soyuz depressurized during descent. Dean reported the Soyuz MS-10 capsule carried out a "ballistic" descent, a normal but steeper-than-usual trajectory heading back to Earth. Ballistic descents have occurred three times during the space station program, subjecting crews to higher G-loads than normal. But the spacecraft is designed for such descents and the crews were not injured. Thursday's launching appeared normal in its early stages as the rocket climbed away, putting on a spectacular show as it smoothly accelerated toward space atop a long jet of flame from its central core stage and four liquid-fueled strap-on boosters. Looking on were Hague's wife and two young children, Bridenstine and other NASA and Russian space agency dignitaries and family members. Live television views from inside the crew module showed Ovchinin and Hague calmly monitoring cockpit displays as they were pushed back into their seats by the steady acceleration. 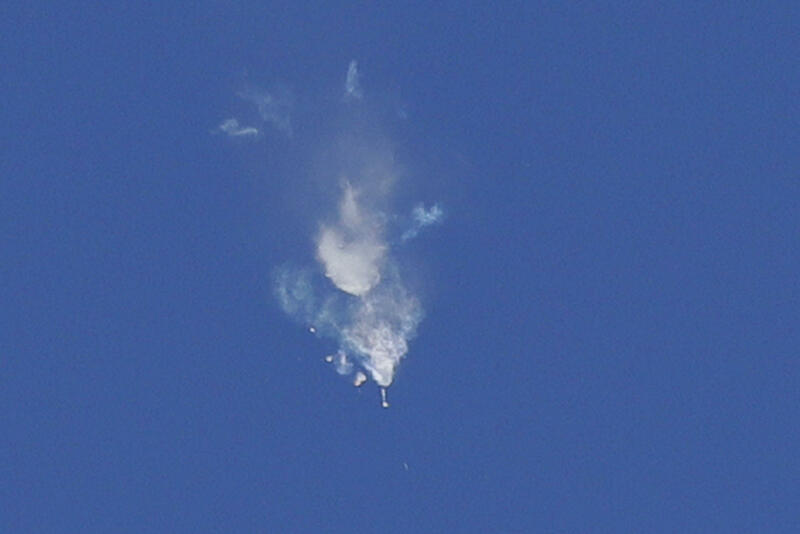 The flight was proceeding normally under the power of its second stage core booster when the mishap occurred. The Russians routinely practice ascent abort procedures and the Soyuz is equipped with multiple systems to assure a safe landing at virtually any point during the climb to space. Before launch, Hague said the Soyuz spacecraft was one of the most reliable ever built. "One of the things I've done over the course of the last two years, we do about three dozen different integrated simulations where they throw every failure they can think of at us." he said. "I've gotten an appreciation for just how the Soyuz spacecraft is. We plan for success and also all of the other contingencies and we exercise against all of those different failures and different contingencies and we're still able to get the mission done, get to the station and still get home. So, if anything, I've got a very high appreciation for just how solid of a spacecraft it is." Hague is an Air Force Academy graduate who married a classmate. He said he and his wife were accustomed to risk, but "it's tough" for his two young boys "to really comprehend the risks." "My wife is active duty Air Force, and so I've stayed at home while she deployed, I've deployed and she stayed at home, we've both been deployed at the same time," he said. "So we understand the risks associated with it and we have come to appreciate each other and understand that we do the things we do because we're committed to serving the country, serving something larger than ourselves."